Want to increase the performance of your vehicle and the look of your vehicle at the same time? 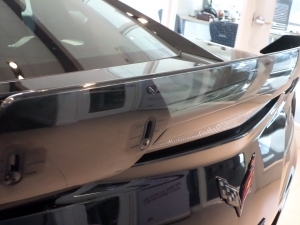 You need this Corvette rear spoiler, part number 84056039, to fulfill both of those requirements in one fell swoop. The rear spoiler helps direct airflow in a way that is advantageous for the vehicle. Where the air rushing into and past the car could possibly slow it down or make it lose traction the spoiler redirects to make the air an ally. The air becomes an external force to help the car perform even better. Let us not forget that it makes your car look even better than before. It will turn heads and perform better. You could not ask for a better combination of benefits. You can buy this spoiler here or you can get it in a kit. The kit is here if you want to get it. The kit includes an assortment of items that you can use increase the attractiveness of your Corvette. Curious of what is in the kit? Take a look at the list below. You can also buy the items separately using the links below. Please note that you need 10 of the rail assembly nuts if you choose to buy them a la carte.